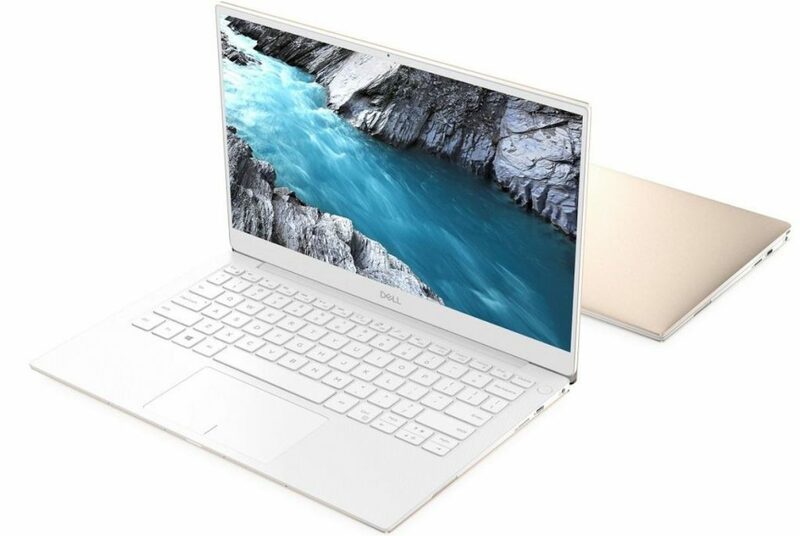 The Dell XPS 13 offers a new color, a powerful Intel Whiskey Lake processor, a 4K screen (and closed the ridiculous "nosecam") - all in a slim, lightweight chassis. Dell has made one of the best laptops even better. 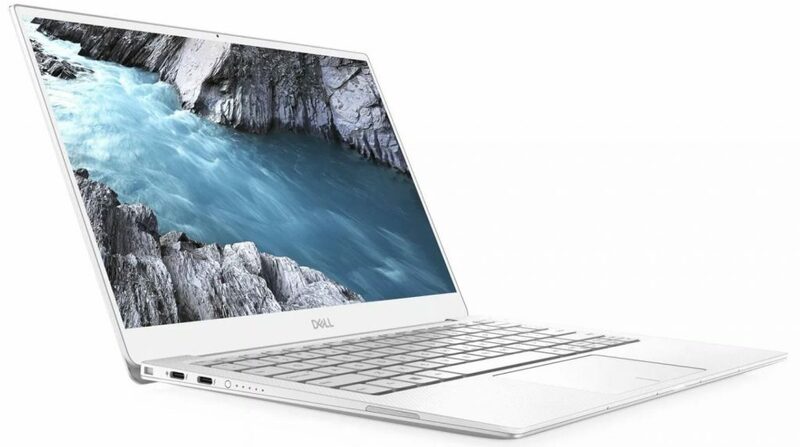 Loaded with Intel’s new Whiskey Lake processor, the Dell XPS 13 is even faster and more powerful than ever. Moreover, Dell finally got rid of that awkward webcam position that always looks up your nose. However, the combination of a 4K screen and an energy-efficient CPU ensures a battery life of almost 8 hours, which can be detrimental to mobile professionals. Still, in terms of design and performance, the XPS 13 remains one of the best in its class. Now, let’s discuss more details about this laptop in our Dell XPS 13 Review. 2019 is officially the year of Frost Silver and Arctic White. 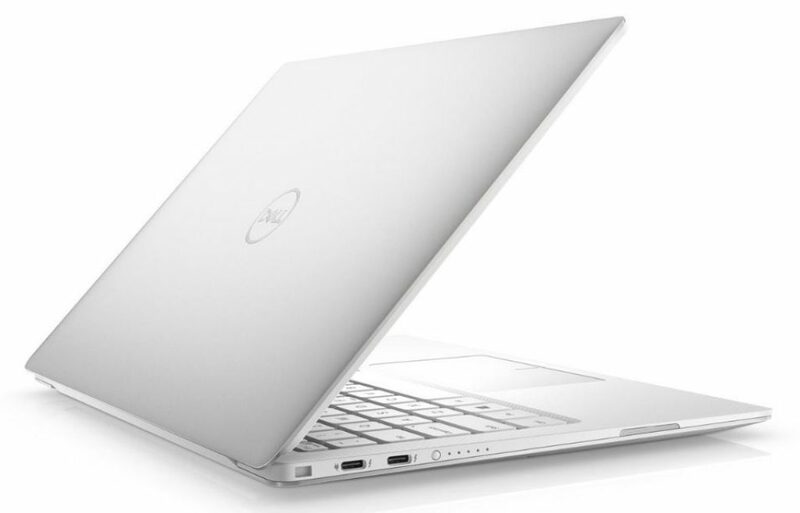 Dell decided to solve the matter with a new color scheme that is just as attractive as the previous model, if not more. The anodized aluminum has a light gray finish that hardly has a pearly shine and looks just as radiant as morning frost just before it makes way for the rising sun. The Dell logo stands triumphantly in the center of the lid as the only decoration. 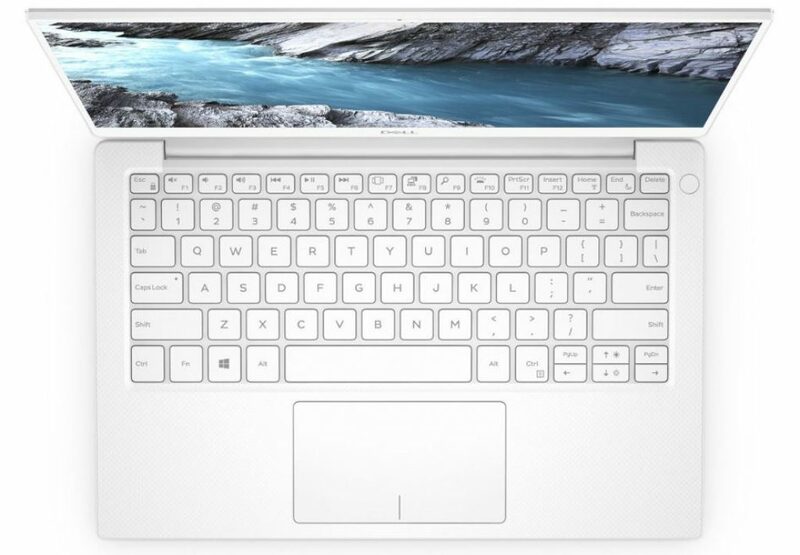 A look along the sides of the system reveals the Arctic White finish that awaits the laptop. The inner deck retains the fiberglass fabric of previous models that are beautiful and strong at the same time. The pristine white continues in the direction of the screen and outlines the borders of the InfinityEdge display. Follow the bezels and you will discover that the webcam has migrated from the bottom panel back to its rightful place in the middle of the top. If Frost is not your thing, the latest version of the XPS 13 is also available in Rose Gold. The XPS 13 does not have many ports, but you can do a lot with it. The pair of Thunderbolt 3 ports on the left and the UBC Type-C port on the right are all suitable for charging the notebook and can act as mini DisplayPorts if you want to connect the system to a larger display. That leaves a microSD card on the right for memory expansion and the headset jack and slot on the left for listening to music and securing your laptop. 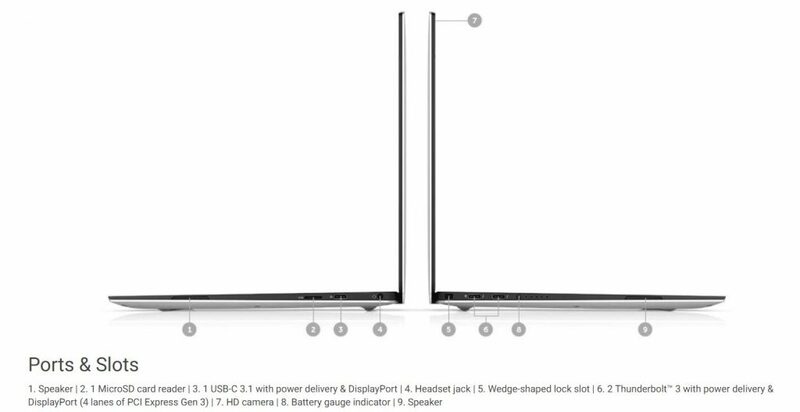 With 11.9 x 7.8 x 0.3 ~ 0.5-inch, the 2.7-pound laptop is a sleek device. With a thickness of 0.6 inches, the Apple MacBook Pro 13-inch (with Touchbar), Razer Blade Stealth and Microsoft Surface Laptop 2 look very similar. The MacBook Pro (3 lbs.) And Stealth (2.9 lbs.) Are definitely heavier, while the Surface Laptop 2 is just a bit sturdier with 2.7 lbs. The keyboard of the XPS 13 cuts a striking image in white, especially when the backlight is switched on. But what is even more impressive is the typing experience. Although we made only 1-millimeter key travel (we usually look for at least 1.5 mm), I never felt like I had reached the bottom when I was typing. And thanks to the 63-gram actuation force (60 grams is our accepted minimum), the otherwise shallow keys had a nice little pop. The 4.1 x 2.3-inch precision touchpad is both fast and accurate, keeps pace with my navigation on the webpage and my pinch-to-zoom, two-finger scrolling and three-finger swiping. Dell continues to manage to have the thinnest bezels thanks to the InfinityEdge design. The top ring is only a little bit thicker than usual to accommodate the webcam, but not so much that you would really notice it. But you forget the thicker edge as soon as you have opened the screen. It produced lush colors when I watched the 4K featurette of Samsara. I was particularly impressed by the deep blacks, rich golden colors and vivid red colors during the routine of the Balinese dancers. The details are also wonderfully fresh, allowing me to see the deep gaps in the timeless stone sculptures. Our unit of Dell XPS 13 features 13.3-inch 4K panel, though, you can also go for a cheaper 1080p panel. The dramatic color splendor comes from the ability of the screen to reproduce 119 percent of the sRGB range, which corresponds to the MacBook Pro and reaches the highest average of laptops of 117 percent. The Stealth, however, was just a bit more lively with 120 percent, while the Surface Laptop 2 reached an incredible 176 percent. With an average of 375 nits, the XPS 13 screen is brights and exceeds the 318-nit average and the 346 nits of the Stealth and 321 nits of the Surface. Do not expect to play graphically loaded games like Battlefield V or Destiny 2 with the Intel UHD 620 Graphics GPU of the XPS 13. However, it can play older or less demanding games. The notebook recorded 88 frames per second on the Dirt 3 benchmark, which ran at 1920 x 1080p. That score beat the average of 73 fps, as did the MacBook Pro (Intel Iris Plus 655) and the Surface Laptop 2 (Intel UHD 620 Graphics GPU), which achieved 47 and 82 fps. But the Stealth with its discrete Nvidia GeForce MX 150 GPU published 164 fps. The side-facing loudspeakers of the XPS 13 were a pleasant surprise. The laptop managed to fill my medium-sized office room with loud audio. Listening to Janelle Monae’s “Can’t Live Without Your Love”, the room was filled with the eager voice of the chanteuse. It overpowered the rest of the song, even after playing with the Waves Maxx Audio software. But listening to “Can You Stand the Rain” by New Edition yielded a cleaner result, such as Guns N ‘Roses’ ‘November Rain’. The XPS 13 just received a Whiskey lake processor update with a performance chaser. Armed with one of Intel’s new Whiskey Lake chips, especially the Core i7-8565U CPU with 16 GB of RAM, the laptop streamed Black Mirror: Bandersnatch from Netflix while I also added 25 additional Google Chrome tabs with a Twitch stream, Tweetdeck or YouTube opened. 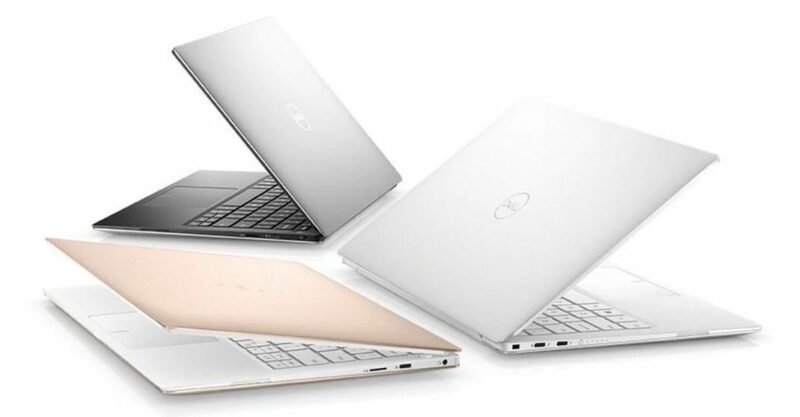 The XPS 13 was effortlessly executing and performing all the tasks without any delay. The laptop has retained its own value during our synthetic tests and scored 14,936 on Geekbench 4, which measures the overall performance. That was enough to get the average of 12,407 premium laptops, as well as the 12,676 posted by the Surface Laptop 2 (Intel Core i5-8250U). The Razer Blade Stealth, which has its own Core i7-8565U scored 15,878, while the MacBook Pro and its 8th generation Intel Core i7 CPU delivered 17,348. When we ran the Excel Spreadsheet Macro test, the XPS 13 took 1 minute and 10 seconds to link 65,000 names and addresses, beyond the 1:31 category average. The Surface Laptop 2 and MacBook Pro were not far behind at 1:15 and 1:16 respectively. But the Stealth blew away the competition and completed the task in 21 seconds. The 1TB PCIe SSD of the XPS 13 took 9 seconds to copy 4.97GB of multimedia files. That translates into a transfer rate of 565 megabytes per second, which was more than enough to beat the average of 529.7-MBps. Neither the Stealth nor the Surface Laptop 2 with their 512GB PCIe M.2 NVMe SSDs can touch it with 254 and 203 MBps. But the MacBook and its 256 GB SSD were way ahead with 2,519 MBps speed. Typically, a laptop as thin as the XPS has problems to stay cool. To combat this, Dell doubled on heat pipes and fans to increase air intake and output. The company also added GORE Thermal Insulation, the same material used in the Mars Rover. The silica aerogels work to dissipate heat throughout the system, keeping things nice and comfortable. The laptop largely satisfied the hype. After running a full-screen HD video for 15 minutes, we measured the touchpad of the laptop, the center of the keyboard and the chassis. The XPS 13 measured 87, 96 and 95 degrees Fahrenheit in the three respective zones. We find everything above 95 degrees outside our recommended comfort threshold. However, I have used the XPS 13 on my lap for more than an hour without any discomfort. If you want longer battery life, we’d recommend you to choose a full HD screen on the XPS 13 and skip the 4K panel. The combination of the high resolution and power consumption of Whiskey Lake requires a bit of a toll. The Dell XPS 13 lasted only 7 hours and 50 minutes on the battery test (which includes continuous web surfing through WiFi at 150 nits). That is well below the 8:30 premium laptop average. The Stealth did a little better with a time of 8:05, while the MacBook Pro and Surface Laptop 2 clocked in 8:43 and 9:22 respectively. The Dell XPS 13 was already a great laptop and Dell has made some welcome improvements to keep our favorite ultraportable overall. The addition of Intel Whiskey Lake cements the status of the XPS 13 as a mobile powerhouse. And if you do not mind the numbers, that vivid 4K screen is perfect for watching videos. We especially like the itty-bitty webcam, which kills the nosecam forever. Although the lifetime of the battery on the 4K screen model could be better, the Dell XPS 13 remains a top choice and is one of the best laptops on the market right now.